The bluesy tunes of J.D. Simo have hit a new high. He has written hundreds of songs, traveled the world, and J.D. has even cut his trademark shoulder-length hair since the last time we talked with him for Maximum Ink just after a successful performance at AtwoodFest a few years ago. But his history in music remains the same; he grew up in Chicago, quit high school, and moved to Nashville. He became a young studio musician and played on more than 500 albums. He says many were popular names we may recognize which made him recognize he didn’t want to play sessions the rest of his life. He formed the SIMO trio, and this second chapter of his music history is still being written. 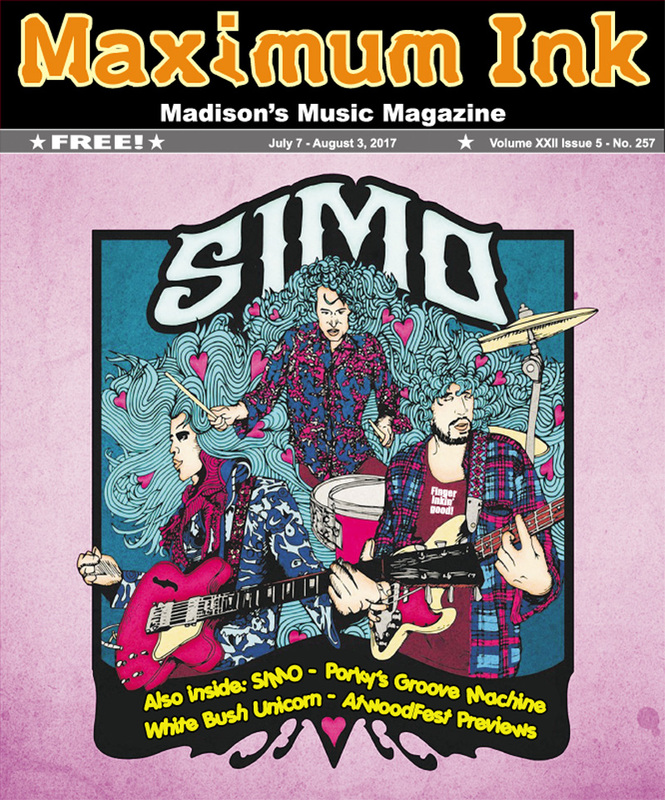 Maximum Ink: You’ll be back for a second AtwoodFest show in July, but you’ve played Madison a couple of times since your first AtwoodFest show. What is it about playing here that draws you back? J.D. Simo: We try not to have expectations of a place when we play there, but Madison is beautiful, and I felt a creative contingent of people, similar to Boulder or Asheville. That’s a feeling that sustains you as you get on stage, and it helps you get into a rhythm. It’s what I did at the first AtwoodFest show, and after a few songs I looked out to see the place was packed. It’s something I want to remember! I’ve actually had people tell me, sometimes as a band is climbing, you forget to live in the moment, so you have to enjoy it. It really was a show we’ll never forget, and I’m looking forward to playing AtwoodFest again! MI: SIMO is a three piece, but you have always sounded so much bigger. Not louder, but bigger. I saw you recently, and the sound is so consistent. JD: I am so very proud of the three of us! We are so conscientious of our sound, and it’s why we use vintage gear, in the context of our heros like the James Gang or the Jeff Beck Group. We want to earn a stake in that lineage. Plus, as a trio, you have to give 100% of your talent, and energy. You have to be completely committed to the music, and we aim to do that every night, so we know not one of us can slack off on it. JD: We all knew of each other in Nashville; Frank Swart (bass) and Adam Abrashoff (drums) were already well-known as a rhythm section, both in studio and with live bands. I’d always hoped to jam with them, and when we finally got the chance, we didn’t prepare anything. We just got together and improvised for hours. It led us to write together, and the three of us were signed to a major label in New York City. But the grind of it got to Frank. He left, we lost our label and manager, but Adam and I were determined to keep it going. Someone we knew, introduced us to Elad Shapiro (bass). We played together and hit it off instantly. It’s been the three of us ever since. MI: You and the band are doing so much of the work on your own. Does it make the effort more personal? JD: The area we’re treading is much more personal. It’s also more like the old days where you are out playing live shows, and word of mouth is helping spread your music. Each of us also had careers outside the group, but we started playing together, liked it, and decided to write together, and record an album a year ago at the old Allman Brother’s home in Macon, Georgia. But, we always keep playing our live shows which are so full of improvisation it’s like a new show every night. The way it’s working for us is really pretty organic; someone sees us, then comes back for another show, and brings more friends. MI: You got married a few years ago, so your personal life is pretty exciting. What’s your hope for your music life? JD: I want it to go where it’s supposed to go. I don’t want to put a limit on it, so instead I’m going to keep working hard, having fun, and I just know everything will fall into place. We’re a working-class band. And we take our work, our music, seriously by going out there every night and putting on a good show. I guess I’d like to build it to a level where I can take care of my loved ones. That’s pretty simple, but it’s what I want in the end. MI: Good luck, and see you at AtwoodFest! JD: Yeah, come enjoy our vibe. When you see us you’ll understand why we say we are very much a live band. And once you see us, we hope you’ll want to see us again, and again. Luckily, Madison has been one of those places to want to see us more than once.